Hi, all! Today we have Justice, a great card to start the week off with. We have had interesting cards lately with lots of intense energy and thought provoking combinations when seeing the sequence from one day to the other. During the past weekend, you were charting your own destiny and today with the Justice card, things are continuing to go in your favor. 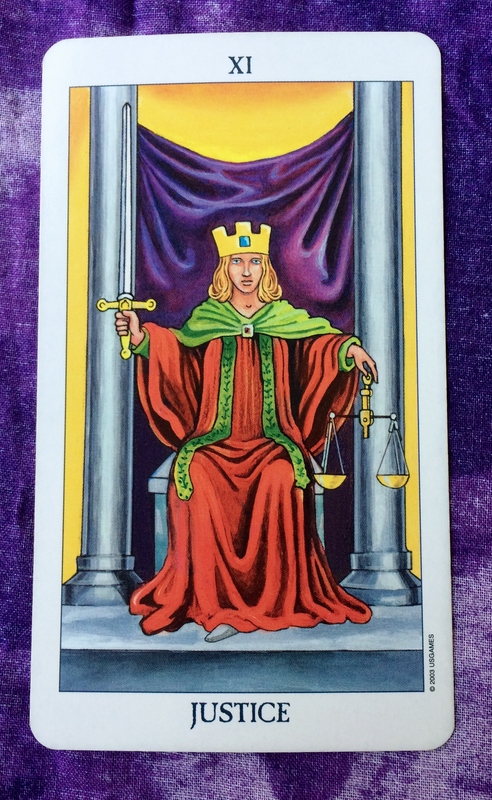 Another interesting note is that we are in the beginning days of the astrological sign of Libra, which the Justice card represents. Sometimes the Justice card is associated with institutions, outside forces, and other people. But I think that today’s energy is more personal, where you will have to strike a balance within yourself. It’s your opportunity to look at your situation and decide what you want and need. Be fair to yourself. You are just as deserving as anyone else. Once you are grounded, then go ahead and spread that sense of fair play in your interactions with others.